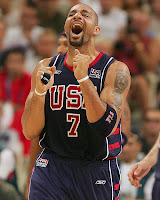 ---Carlos Boozer plays our hero, Rocky Balboa. Just like Rocky, Boozer was just another tough guy thought to be too small for the big time. No one from Philadelphia/Duke ever makes it in the real world, right? Wrong. Boozer came out of nowhere (the 2nd round) to become one of the most dominant strongmen in the world, just like Rock. But now, the champ has lost some of his luster: Rocky lost his belt to Ivan Drago, and Carlos has lost his mojo to Lamar Odom's length. While Rocky had to travel to Russia to avenge the death of Apollo Creed, Boozer must also travel to the far east to redeem his dismal playoff disappearance. Can Boozer be like Balboa and win over the Chinese naysayers and show the world once and for all that (1) he is a champion and (2) anyone, even foreigners, can change? Stay tuned. Money Quote: "If I can change . . . you can change . . . everybody can change!" Deron Williams takes on the role played to perfection by the indomitable Carl Weathers: Apollo Creed. After reaching the pinnacle of achievement (a title for Apollo; a fat contract for Deron) each man decides he must further challenge himself. For Apollo that meant fighting Ivan Drago; for Deron that means playing 2-guard behind Jason Kidd. In the end, however, neither man properly prepares himself for the challenge and they are killed in the heat of competition by their opponent. Oh, whoops, that analogy sucked. Let's just move on. Money Quote: "Get your hands up, it's time to go to school." 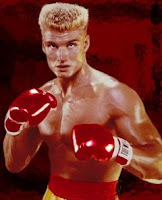 In the role he was born to play, Andrei Kirilenko takes on the role of Russian fighting machine, Ivan Drago. A mysterious hulk of a man, he comes out of nowhere to take the world by storm and capture the highest achievement in his chosen field: with the help of anabolic steroids. But Kirilenko's gold medal, and Drago's belt are not enough. THEY FIGHT FOR BLOOD (and patriotism)!!! 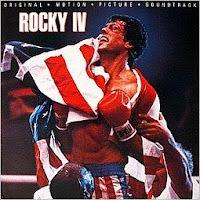 Just as Drago takes it to Apollo and Rocky, so must Kirilenko fight for his homeland's pride against Deron and Boozer. Dolph Lundgren played Drago to a steely-edged perfection, while Kirilenko's version involves a lot more giggling and chocolate milkshakes. Money Quote: "If he dies, he dies." Unfortunately, Travis Hansen will not participate in Monday's showdown, nor will he be by Kirilenko's side when the Russian flag enters Olympic stadium. Had he been asked, he would have played the role of Drago's evil, controlling, blond (traitorous?) wife, Ludmilla. He would have been phenomenal. Money Quote: "You have this belief that this country is so very good and we are so very bad. You have this belief that you are so fair and we are so very cruel." 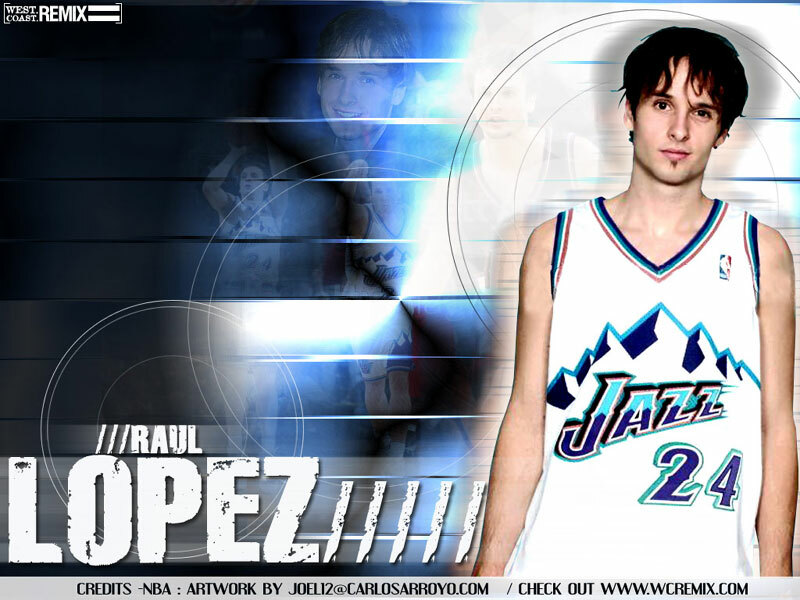 Also featured in Sunday's production will be former Jazz draft workoutee, Sasha Kaun (master of word processing). Sasha will be guarding Dwight Howard. Billy Dee? How about Carl Weathers? Oh man, HUGE mistake on my part. I mixed up Colt .45/Lando Calrissian with Apollo Creed. Totally unforgiveable. Corrected. Travis Hansen is as UNAMERICAN as communisim. May his soul rot in a decrepit soviet-era apartment building. He deserved that comparison. 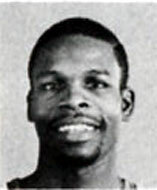 I hear that Mikeli Wesley is trying to play for the North Korean national team.